Although periodontal disease isn’t the usual cause of pulpal death, inflamed and infected gums greatly increase your risk of tooth loss and the need for invasive treatments like root canals. Brushing twice every day is important for your dental health, but brushing alone isn’t enough to maintain your healthy smile. If you make flossing an integral part of your dental care routine, you’ll be less likely to lose your teeth and need dentures when you’re older. 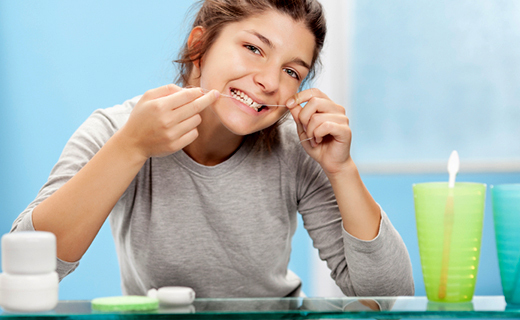 A consistent flossing routine produces real results. If you suffer from sensitive teeth or bleeding gums, you may be tempted to skip the dental floss. You might assume that flossing will make your condition worse. In reality, it can actually improve gum health at almost any stage and even stop the bleeding. In 2006, a study involving 51 sets of twins revealed the results of daily brushing versus brushing plus daily flossing. One twin in each pair was told to only brush their teeth. The other twin flossed in addition to brushing. After a two-week period, the twins who flossed had significantly fewer areas where gums were bleeding. Starting and maintaining a good dental care routine is beneficial at any stage of life, even if you were not consistent about cleaning between your teeth when you were young. With the right floss, you can significantly improve the condition of your gums and avoid future problems. If you have sensitive gums or your teeth are close together, look for specialized flossing products designed to address these issues while still removing plaque buildup. It’s never too late to add flossing to your daily dental care routine. To learn about our family dentistry practice in Atlanta, call today at or make an appointment. Dental One Associates offers affordable family dentistry and gentle, compassionate dental care in Atlanta. With 8 affiliated practices throughout Georgia, our offices are conveniently located with extended hours to meet your needs. At , we provide most dental services, from basic preventative care and general dentistry to specialized procedures and complete dental reconstruction. We accept most dental insurance plans and offer affordable financial solutions for any budget. Patient satisfaction is our top priority and we strive to provide the exceptional, affordable dental care and personal touch that lead to lasting relationships. A smiling patient is our greatest reward and we look forward to keeping those smiles healthy, beautiful, and bright. Discover an affordable dentist who truly cares at .